Traveling must be an affair to remember through out the phase of life and living. The land of fairy tales will enchant your days and nights. The coastline of Kerala is considered to be the dream of every mortal soul. Whether you take a dip in the greeneries of hill stations or the leisurely back waters, Kerala is the living heaven on Earth. Kerala also ensures that the visitors take back all little richness along with them. There are hotels and accommodation hearths in every nook and cranny of this Southern state of India. There are certain things that must always be kept in mind while packing your bag; reasonable, yet facilitates refreshment and rejuvenation. There are hotels is the every area such as Hill Station, Backwaters, House boats and Hotels in beaches. The best place to stay in Kerala is Houseboats. There are houseboats floating across the canals and lakes. This is the most romantic place to go and spend time with your beloved. Often the tourists live under the idea that the house boats are not a safe place, but there is every form of prevention available in this periphery of laughter and smile. The house boats are furnished with futuristic d�cor; amazing deck that invites bright sun to be part and parcel of your life, kitchen which is fire proof, fire extinguisher is also available, attaches toilets which are separated from the crew members for the privacy of the tourists. The astonishing part of this particular accommodation is that the house boats are also available for large families. The visitors can also take a break from the world of consumerism in the short trips to the tranquil and idle waters of Alleppey and Kollam. There are huge array of recreational facilities in this hub where Accommodation is a smooth ride. The people of Kerala believe in treating guests like Gods. The age-old phrase that Indians follow which goes "Atithi Devo Bhava" means that a guest is equal to God. You will find a unique type of accommodation in Kerala. People living away from the city, in quieter villages, offer a part of their home for tourists to stay. Home stay in Kerala is quite common and you will get all modern facilities with a traditional touch. In Kerala, homestays are an ideal way to get in touch with the locals and learn more about Kerala and India. You will truly feel relaxed in a home stay accommodation in Kerala. Home stays give you an opportunity to know Kerala from a closer point of view. You will get to know how people in Kerala live their daily lives, you can pick up some commonly used phrases in the native language and hear the amazing folklores of Kerala. What's more, you will get to eat home cooked food in traditional Kerala style. The aroma is enough to send you scurrying to the kitchen! A homestay vacation in Kerala will ensure that you experience home away from home. You can tour nearby local areas with ample of directions provided by the locals. You can also ask them to tag along with you. A homestay in Kerala is an experience in itself. The warm and caring attitude of people of Kerala is enough to make you fall in love with Kerala! So pack your bags and come to Kerala for an experience that will leave you asking for more! Kuthira Malika or the "Mansion of Horses", is a palace built by Sri Swathi Thirunal Rama Varma, on the south-eastern side of Padmanabhaswamy temple in Thiruvananthapuram. The palace gets its name from the 108 horses that are carved into the wooden wall brackets that support the southern roof. 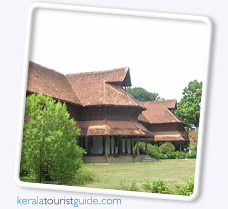 Built in the 1840s, Kuthira Malika is fine example of traditional Kerala architecture, with its typical sloping roofs, overhanging eaves, pillared verandahs and enclosed courtyards. Intricate carvings adorn the wooden ceilings with each room having a distinctive pattern.